LZS’s 5903HPC provides up to eight Intel Xeon 7500 Series processors, 2TB of DDR3 memory in 64 DIMMs, 10 PCI-E 2.0 expansion slots, Gold / Platinum Level 80Plus power supplies, and up to 24 2.5" hard drives into 5U to deliver exceptional density. In addition users can integrate up to 4 GPUs to take advantage of the exceptionally large memory footprint to address heretofore unmanageable large scale computing projects. 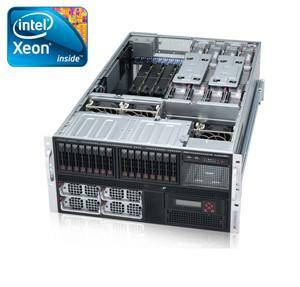 Up to 8 Intel® Xeon® processor 7500** series (8-Core) and next gen.